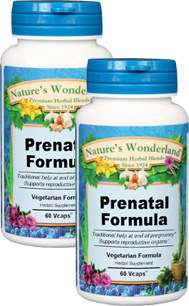 Prenatal Formula, 60 Vcaps - 475 mg each (Nature's Wonderland) - Penn Herb Co. Ltd.
Prenatal Formula is formulated for use during the last 6 weeks of pregnancy. The special blend of herbs promotes elasticity in the pelvic area and serves to strengthen the reproductive organs, contributing to an easier delivery. Black Cohosh Root, Blessed Thistle, False Unicorn Root, Lobelia Herb, Pennyroyal Herb, Raspberry Leaves, Squaw Vine; Plant Cellulose (Vcaps™) - vegetarian capsules. As an addition to the daily diet, take 1 or 2 capsules three times daily with water at mealtimes. FOR USE ONLY DURING THE LAST 6 WEEKS OF PREGNANCY.